Will the first season of the Dirty John TV show on Bravo leave viewers craving for more? As we all know, the Nielsen ratings typically play a big role in determining whether a TV show like Dirty John is cancelled or renewed for a second season. Unfortunately, most of us do not live in Nielsen households. Because many viewers feel frustration when their viewing habits and opinions aren’t considered, we’d like to offer you the chance to rate all of the first season episodes of Dirty John, below. 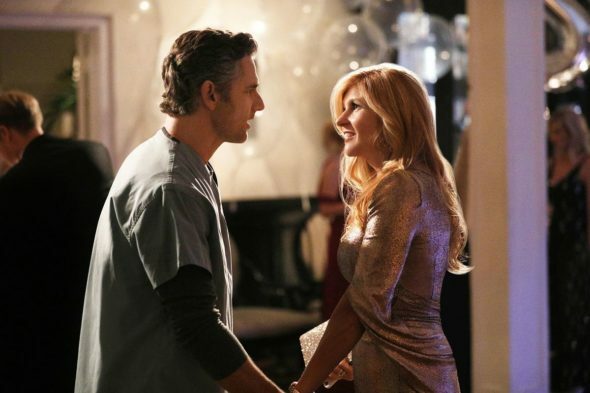 A Bravo true-crime anthology series, the first season of Dirty John stars Connie Britton, Eric Bana, Juno Temple, Julia Garner, and Jean Smart. In the story, middle-age Debra Newell (Britton) seemingly has a perfect life but she doesn’t have love. When she finally meets handsome doctor John Meehan (Bana), Debra is quickly swept off her feet — much to the dismay of her daughters, Terra (Julia Garner) and Veronica (Juno Temple). The backstory of Debra and her mother Arlane (Smart) provides insight into why she may have been so vulnerable to the charms of a man who is not who he seems to be.